It’s raining! Is the drought over? Intense activity over the south-east is caused by a relatively unusual cut-off low from Antarctica. Photo: BOM. It’s cold and the rain is falling steadily. As a brutal drought grips much of eastern Australia, is this good news? Is the drought finally breaking? Unfortunately, no. Professor Janette Lindesay from the ANU’s Fenner School of the Environment is one of Australia’s most distinguished climatologists. She says that while steady soaking rain is welcome, the long-term outlook for most of eastern Australia remains grim apart from a small pocket of the south-east. 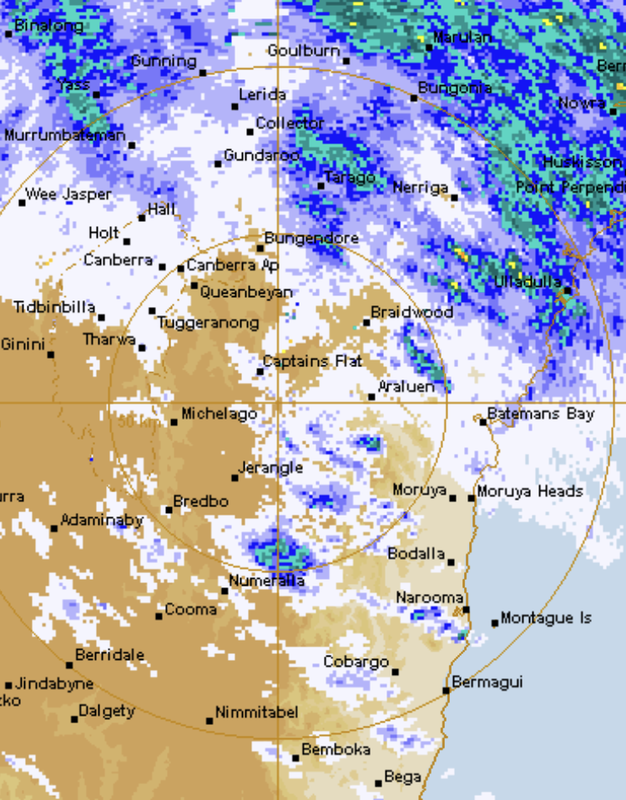 The rain we’re receiving in Canberra and further east comes from a relatively unusual cut-off front. Professor Lindesay describes this as a “pool of cold air that breaks off from the Antarctic air mass and moves northwards, pushed up by a sharp bend in the polar jet stream”. The southern hemisphere polar jet stream is a pattern of westerly winds sitting high up in the atmosphere, around 10kms. It usually acts as a cordon around the Antarctic cold air. But when the jet stream’s arc bends away from its usual course, it brings cold air and cold fronts with it. “Imagine a piece of string, make a big bend in it and then pinch that off. That pool of cold air is separated and drifts off over the continent. It encounters hotter Australian air, creating instability in the atmosphere. The resulting weather event is quite intense, but essentially small and localised,” Professor Lindesay says. The combination of cold air and significantly warmer ocean temperatures is a volatile one with a lot of embodied energy, creating perfect conditions for thunderstorms, but it’s an isolated occurrence. The current cold, wet weather is unfortunately not an indication that the broader seasonal forecast is changing. “We have an El Nino brewing in the Pacific, that is not developed fully at this stage, but the ocean temperatures are in place. So while the atmosphere has not fully responded yet, all the factors for an El Nino will be in place by the end of summer. The Indian Ocean Dipole currently indicates that sea temperatures near East Africa are warmer on the surface than usual, while ocean temperatures in Indonesia are cooler. In turn, there’s very little moisture being gathered up with the prevailing winds across the Australian continent. But on the North East Australian coast, ocean surface temperatures are warmer than usual. That hot, dry air is causing the current northern heatwave. The heatwave effect is intensified because the weather systems coming across the continent aren’t bringing any rain with them. Professor Lindesay says the current drought is deeply embedded, and it would take several months of above-average rainfall to penetrate the parched soil profile. Heavy rain causes run-off that can’t be stored in the soil profile, while light rainfall is almost immediately offset by evaporation from the high temperatures we’ve been experiencing. “This is a changing climate, absolutely,” she says. “We are seeing a combination of climate change trends, overlaid with the usual weather patterns. The whole ocean temperature is increasing. It’s not uniform, there are warmer and cooler areas. But as a whole, it’s undoubtedly rising. That’s prompting more dynamic interactions between the oceans and the atmosphere because there’s more energy available. Do you believe the current weather is evidence of climate change? I don’t think the issues is whether climate change is believed. The problem is any weather event is reported as climate change; hot, cold, wet, dry. Taken as absolutely fact that climate change means more variable weather; so any extremes are climate change in action. However the media also rush for quick statistics – hottest summer in 50 years, biggest flood in 100 years etc. And clearly we were not talking climate change 50 or 100 years ago.